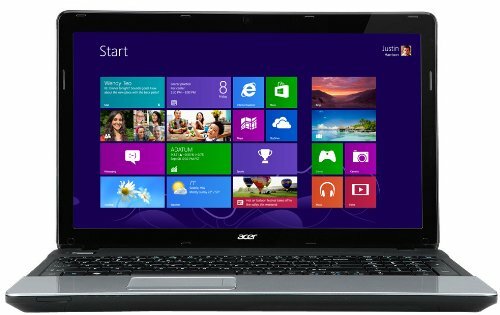 Below is our review of the Acer Aspire E1, a 15.6" laptop, featuring 4GB RAM, 500GB hard drive and Windows 8 64bit. The processor fitted to the Acer Aspire E1 is from Intel, and it compares favourably to other laptops we've tested in terms of CPU. Load time from cold is around the minute mark - due to the Intel Core i3 3110M running at 2.4GHz and the 6GB of RAM fitted. At the current price of around £349, this is a pretty decent specification, especially considering the fact that this laptop also includes the latest Windows 8 64-bit operating system from Microsoft. Storage wise you have a 500GB hard drive operating at 5400rpm - offering more than enough room for the majority of users. The screen is the standard 15.6" diagonally - and offers a decent picture, as per most of Acer's laptop ranges that we've tested over the years. Colours appear vivid, and the overall picture is pretty sharp - none of our testers had any issues with this aspect of the notebook. Acer describe this technology as "CineCrystal HD LED-backlit LCD" - and it gives pretty good visuals in 16:9 cinematic format at 720p. The HDMI port enables you to output the picture to an external monitor or TV via an HDMI cable - so watching media such as movies on a larger screen will not be a problem. The speakers aren't bad at all - but as with the vast majority of laptops in this price range, for both privacy and audio purposes you may well wish to invest in a decent set of headphones or external speakers to improve audio quality. The laptop performs pretty quietly, with the fan only kicking in every now and then - overall we had no issues with the noise of this notebook during our test period. The keyboard is comfortable to type on - each button has a nice action, and we get the impression that typing for long periods of time will not cause any issues. The keyboard is surrounded by a similarly coloured black bezel, whereas the Multi-gesture Touchpad, situated slightly to the left of centre, has a silver exterior surrounding it. Also included are the standard webcam, located to the top of the display, a DVD player, 3 x USB ports, HDMI output, headphones, microphone, multi card reader and ethernet. Dimensions are as follows: 38.2cm by 25.3cm by 33.2cm - so small enough to be highly portable yet large enough to comfortably work in front of without feeling cramped. From a design perspective it is a plain looking notebook - however the specification and value for money more than makes up for this. The notebook feels solid, has little flex in it, and feels like it will last the day to day wear that will occur during normal usage. Included inside the box are the Acer Aspire E1 laptop, with it's battery, power cord, and a user guide. Decent Processor, 6GB of RAM, 500GB Hard drive - all in all a pretty good spec for the money. None to speak of - the Acer Aspire E1 offers very good value. If your budget for your laptop is sub £400 - then the Acer Aspire E1 at around £349 should be a serious contender - a good all rounder with a decent specification.